Cut Resistance Confidence: What Gloves are Best For You? Cut Resistance is an extremely important requirement when handling sharp materials and or equipment. Knowing where each pair of gloves provides cut resistance is just as important as the cut resistance performance. By purchasing Elliotts cut resistant gloves, you are investing in a product which is fully certified to Australian and New Zealand standards by an independent 3rd party SAI Global. For a product to be “certified” to a standard, the manufacturer must satisfy an extensive list of requirements, including the testing of product samples, on-site factory assessment, annual factory surveillance audits, and on-going type testing. If the certification isn’t clearly displayed on the product, then it is likely it hasn’t been tested to these standards, or perhaps any standards at all. Without these certifications, you are placing the safety of you, and your workers, into unknown and possibly dangerous hands, therefore increasing the risk of both injury to employees and potential prosecution by the relevant safety authority. Why invest in cut resistant gloves if you are unsure of the performance level. When working with sharp materials or equipment, this is not a risk worth taking. When you buy a pair of Elliotts’ cut resistance gloves, you also purchase peace of mind. To help you easily understand what specific Cut Resistance each pair of gloves provides, we have created Protection Zone graphics that clearly identify where each glove provides protection. Protection is provided on the green shaded areas. 360° Cut Protection means that your palm, back of the hand, finger sidewalls and depending on the glove length your wrist are all protected. Protection is provided on the green shaded areas. Cut protection is provided on the palm and finger side walls. Finger Side Wall Cut Protection. Protection is provided on the green shaded areas. 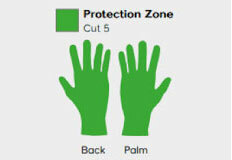 Cut protection is provided on the palm only. The back of hand and finger sidewalls do not offer cut protection. 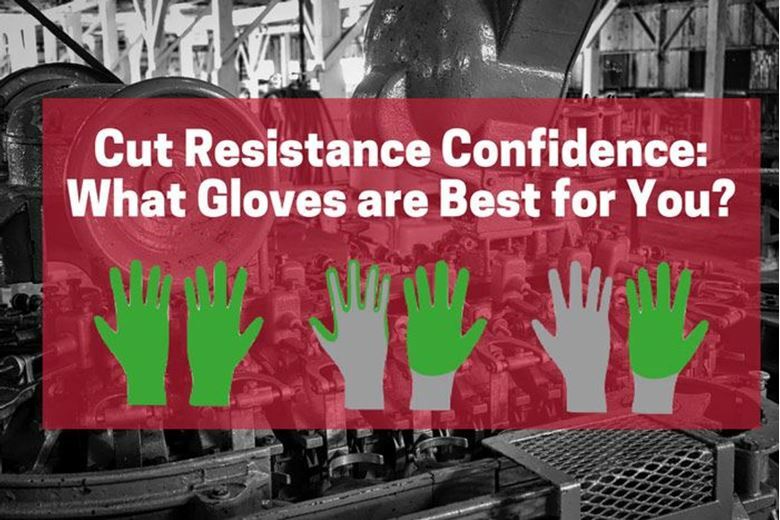 There are now two cut resistance test methods to consider when selecting cut resistant gloves. Under the EN 388 glove standard, introduced in 2003, cut resistance is measured with a Coup test machine. A section of fabric is placed in a holder and a rotating circular blade is moved back and forth at a constant speed, pressing down with a force of 5 Newtons. When the blade cuts through, a performance rating from 1 to 5 is calculated from the total distance of travel. A rating of 5 being the highest level of performance. The blade gradually loses sharpness, so at the start and finish it is calibrated using cotton fabric. Therefore, the result can be less accurate for gloves with a higher cut-resistance. This test method remains in the 2016 version but is only to be used for materials that do not affect the sharpness of the blade. The new 2016 revision of EN388 includes a new cut test method EN ISO 13997. TDM is an abbreviation for the equipment used to conduct this test, a tomodynamometer. This test involves a straight blade being drawn across the sample in one movement, with a new blade every time. The 'stroke length' before cut-through is recorded for a range of forces and graphs plotted to predict the force required to cut through the glove in 20mm of travel. This force is used to calculate a score from A to F, with F being the highest rating. The AS/NZS 2161.3:2005 standard which mirrors the EN 388:2003 version has not been revised to mirror the 2016 edition at the time this blog is written. Elliotts will, however, be progressively testing out cut resistant and impact resistant gloves to these new standards and will be displaying those results on our website in due course. For more information on our range of cut resistant gloves, visit our website. Cut Resistant Gloves – What’s the Difference Between EN388 and ANSI/ISEA 105?